X- / Y- / Z-size: size along the world reference frame's x- / y- / z-axis. Sides: number of sides of a cylinder, disc or sphere. Faces: number of faces of a cylinder(*) or sphere. Smooth shaded: whether the shape should appear smooth (Gouraud shading) or sharp. Open ends: whether the cylinder has open ends. Cone: indicates that a cone is desired instead of a cylinder. 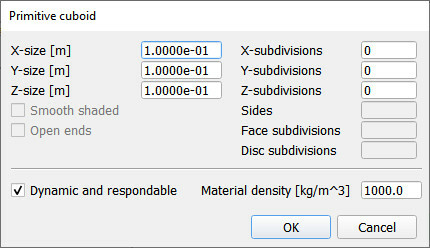 Create dynamic and respondable shape: if selected, the generated shape will be dynamic and respondable. It will not not be collidable, not measurable, not renderable and not detectable, and have a slight blue color, in order to quickly recognize it. Create pure shape: if selected, a pure shape will be generated that performs much better and faster during dynamic calculations. Material density: the density of the material. Shape has negative volume: when checked, then created pure shapes will have a hole inside (i.e. 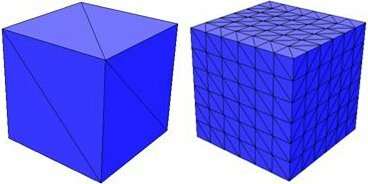 a negative volume) that has the dimensions of the shape scaled by the Inside scaling factor. This is a useful feature to create tube-like structures that can be efficiently simulated dynamically. Currently, only the Vortex Dynamics engine supports this feature. Shapes with a higher subdivision count reflect lighting in a more differentiated way. See the triangle edit mode and the Subdivide largest triangles option for more details. Colors and other visual attributes should be adjusted in the shape properties. The shape mesh can also be adjusted and edited in the shape edit modes, or in the geometry dialog.